...that the Jiralhanae homeworld Doisac has three satellites called Warial, Soirapt, and Teash? ...that the San'Shyuum regarded the Planet of Blue and Red as one of the wonders of the galaxy? ...that the Halo game engine was also used in a game called Stubbs the Zombie? 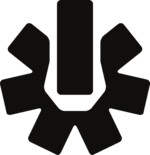 The Seventh Column, also referred to as The Septagon, is a symbol commonly associated with Bungie and the Bungie community. It consists of a hollow ring with seven rectangular spokes. The uppermost spoke is located in the middle and is not connected to the rest of the ring. Originally, the Seventh Column was used as the symbol of Bungie's long-standing forum fan club of the same name. Over time, the symbol has gained a variety of meanings, most commonly representing the Bungie community or Bungie itself as a whole. The steps are found in the extra disk that comes in the Halo 3 Legendary edition. The Seventh Column symbol appears frequently in the Halo universe. It is used by the UNSC in tactical maps to identify friendly units or bases. It appears in the level Crow's Nest and some multiplayer maps in Halo 3, where some of the wall mounted computer monitors have white Seventh Column symbols among the contact icons. Also in Halo 3, the Seventh Column emblem can also be seen on UNSC pilots' helmets. In Halo: Reach, the Pillar of Autumn's insignia, - which is actually the Marathon symbol - as seen on the side of the vessel and on Captain Keyes' ID patch, is replaced by the Seventh Column symbol, likely due to property rights issues. The large monument in the Halo 2 multiplayer map Headlong resembles the Seventh Column symbol; the monument's appearance has been changed in the Halo: Anniversary remake Breakneck. In the Matchmaking lobby in Halo 3, the Seventh Column appears in the player's nameplate if they have logged onto Bungie.net using their Gamertag. A player gets awarded the Linktacular medal if they play a game in which all players have the Seventh Column by their name.